I had a leisurely, lovely breakfast with the first of my Green Market finds from Wednesday. I brewed some Vienna Roast coffee, fired up the broiler, and toasted up some crostini while I heated up the goat cheese. It was delicious. The cheese was soft and creamy with just the tiniest hint of sage to mingle with the subtle sharp tang of the cheese. There was just the right amount of garlic rubbed on the crostini--it was happy to linger in the background, coming forward every once in a while with a little bite just to remind you it was there. I have been wanting to participate in the May eat local challenge, but for various reasons that has been difficult for me. Now that the farmers' markets are open, it should be easier for me to find local produce. The cheese came from Prairie Fruits Farm in Champaign, IL, the first licensed farmstead cheese operation in Illinois. I don't remember where the bread came. I'll look for it next week and let you know. It's really good. For the crostini: Slice any good-quality bread and cut into approximately 3-inch squares and place on a baking sheet. Brush with olive oil and broil for around three minutes, until toasted. Remove from the oven. Cut a clove of garlic in half and rub the cut edge over the tops of the bread. For the cheese: Put a little bit of olive oil in a baking pan and spread it around into a circle. 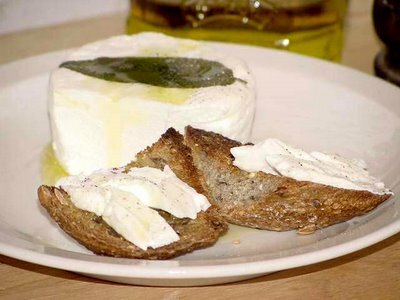 Place the goat cheese on the oiled part of the pan and put it in the oven while the crostini is broiling. Keep it in the oven until the cheese is well heated but not melting (between three to five minutes). Check it often. When it's ready, take it out and transfer it to a plate. Pour about a teaspoon of olive oil on top of the cheese, then add some freshly ground pepper, if desired. Spread cheese on crostini. Enjoy.